Can you imagine a birthday party or a wedding day without a gorgeous cake? We certainly can’t! Or how about eating a nice piece of cakethat melts in your mouth after the dinner? Sounds so tasty that we just have to make one! And this particular recipe for simple and sweet cakes is the Nigerian cake. Less talk, let’s step right into the cake making! How to make Nigerian cake? Cake making can be quite tricky, especially if you are doing it for the first time. But don’t worry! We will guide you step by step with this Nigerian cake recipe,and you will know. how to make Nigerian cake from scratch in no time! 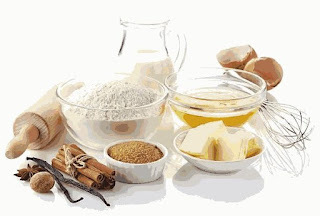 Note that the quantities that are listed below were used to bake a cake in a 10-inch diameterand 2.5-inch deep cake pan. You will need the following ingredients. = a half cup of dry fruits. 1. The flour has to be plain, not self-rising. You will never know how much baking powder the manufacturer has added to the flour. It is better to use the plain flour and the baking powder instead. 2. The brandy is optional. It works as a preservative for the cake. Because of the large amount of eggs in the cake, it may go bad in a few days. If you are going to decorate it (like a birthday cake or a wedding cake), then it is better to add half cup of brandy to it. But, if youare going to eat it the same day, there is no need for the brandy. 3. You have to use the baking butter, do not use margarine. Also, don’t melt the butter! Justtake it out of the fridge for a few hours - it will be soft enough for creaming. 4. If you want to use dry fruits in your cake, then soak them in brandy for at least a week. The reason for that is the Brandy will act as a preservative for the fruits. If the cake has to stay for a long time, then use the brandy! 5. Check the sugar. You will need to add it to the soft butter and cream it. If it is very granulated, then consider grinding it with a dry mill. It will save you some time during the creaming process. Listing the needed tools is not quite necessary. =Cake pan that is 10 inches in diameter and 2.5 inches deep. Got everything that we’ve listed? Great! Now it is time to make the delicious and gorgeous Nigerian cake. Note that it will take quite a bit of time, it is not a fast recipe. Make sure you don’t have any plans for the day or the evening. 1. Take a large bowl and put your soft butter and the sugar in it. Use the mixer to cream them. Depending on your mixer, it may take up to 60 minutes in order to make a well-creamed mix.Important Note: Use the highest setting on your mixer in order to save some time. Read the user manual before creaming. Some mixers should not run for more than 10-15 minutes at a time. Take breaks if needed. It is better to take things slowly than to burn your mixer. 2. Taste your well-creamed mix. It should be white, soft and the sugar has to be barely noticeable. The mix should drop from your spoon. However, it is okay if you still feel the grains of the sugar as long as the mixture is the right color and texture. 3. Leave the mixture and take a baking pan. Rub it with soft butter and sprinkle it with flour.Make sure that you’ve got every part of the pan- the greasing and the flour will prevent the cake from sticking to the pan. 4. Take another large bowl and break in the eggs. Use a mixer or a whisk to beat them.5. Add the eggs to the sugar/butter mixture. Mix them well. You need to have a smooth blend. It will take you from five to ten minutes.6. Preheat your oven to 150°C and switch it to the up and down heating setting.7. Add the vanilla extract to the mixture. You may also add other flavors, like orange extract, for example. Add brandy and dry fruits (if needed). Stir the mixture carefully with a spatula. Make sure that all the ingredients are well mixed.8. Take another bowl, mix the baking powder and plain flour.9. Use a sifter and add the plain flour/baking powder mix to your prepared mixture of eggs, sugar, butter and other ingredients. Add by little portions. Stir from time to time with a spatula and make sure that the ingredients arewell mixed. Stir only in one direction. 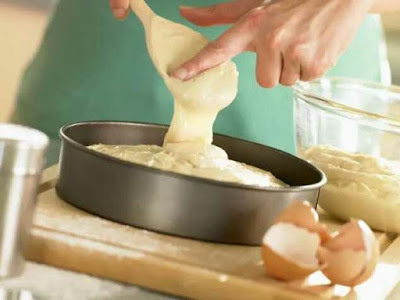 If you stir in different directions, the bubbles will be trapped in the cake, and it will be full of holes after baking. It is also extremely important to use a sifter, so there will be no lumps of flour in the cake. 12. Put the cake pan into the preheated oven. Make sure it is in the middle of the oven. 13. Wait for the cake to rise - it may take two hours or more. Don’t open the oven door! It willdrop and won’t be as good as it could be. Do you want that? 14. When you are sure that the cake is not rising anymore, open the oven door and use a knife to check if it is ready. Dip the knife into the center of the cake. If it comes out with pieces of dough, then the Nigerian cake is not done yet. Also, check if the cake separates from the pan.Important Note: You can also use a wooden skewer to check the cake. Dip it into the middle of the cake and see if it comes out clean or not.The last important test is to push the cake gently with your palm. If it springs back and there is no sign of it on your palm, then it is ready. Make sure to use multiple ways of checking the cake so that you won’t end up with an undone cake. 15. Take the cake pan out of the oven and let itcool for five minutes. Take off the sides of your cake pan and let the cake cool completelybefore decorating it. 16. Eat it!And there you have it - an easy Nigerian cake recipe. Now you know how to bake cake, and you can surprise your friends or relatives. Try and add something new to it - layers of cream, fruits, jelly. Anything that comes to mind! Create a beautiful and tasty cake for a birthday,wedding or just as a treat for the family. And be creative with the decorations!